Furisode brand Ichikura is now taking orders at all its stores together with select La Bliss stores of Mika Ninagawa‘s second collection of Ichikura furiosde. 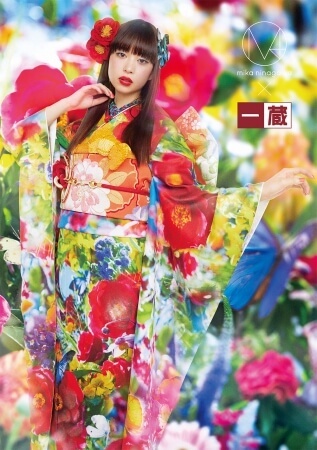 A photographer and movie director, Mika Ninagawa was responsible for the direction of the collection, adding seven new strikingly colourful furisode to the arsenal modelled by actress Aoi Morikawa. M / mika ninagawa is a brand directed by Mika Ninagawa herself which first collaborated with Ichikura in 2017 to release a furisode collection. Sakura Miyawaki of the popular idol groups AKB48 and HKT48 was the first to model for the colourful collection series which drew huge attention. Orders for the second M / mika ninagawa furisode collection opened on April 28 at 24 Ichikura stores and 3 La Bliss stores. This collection includes seven never-before-seen designs, embodying the grace of Japan’s four seasons with vibrant colours like pink and crimson. Full details were posted on the Ichikura website on May 21, so be sure to check them out. Furisode are traditionally worn in Japan on Coming of Age Day which celebrates those turning twenty years old. It’s a once-in-a-lifetime ceremony, so why not challenge yourself to wearing one yourself?